Forge Motorsport Big Brake Kit - Pann Auto Performance - San Diego largest aftermarket automotive performance parts - What do you drive? 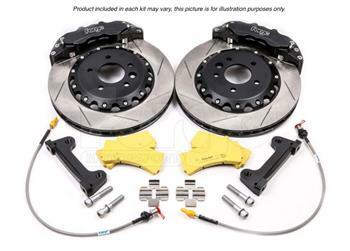 A Big Brake kit with calipers, rotors, lines & pads. The discs are grooved to remove braking residuals and maintain optimum performance. Included in the kit are Forge braided brakes hoses, mountings, and EBC pads. This kit is suitable for vehicles with 17 inch or larger wheels. For vehicles with 19” or larger wheels you may wish to consider our 356mm disc option.